If God had wanted me to make my fortunes in the “beautiful game,” He would have sent a soccer coach into my little hut on the Amazon. Instead, he sent us an American who perhaps had not even seen a soccer ball in his life. The man used to go up and down the many tributaries of the Amazon, sharing Christ with some of the “least of these,” because, as he told me the story, during World War II, he was scared that the Germans might sink the ship where he was serving, so he promised God that, if he survived the war, he would dedicate his life to share the good news of Christ with people who lived in remote villages like the ones he had just seen somewhere in the world. And whoever heard of someone keeping a promise that was made under duress at a time when you feared for your life? I guess even God might give you a homework pass on that one. But not Bill Burk, self-nicknamed “Amazon Bill.” He and his new bride went to Brazil and their calender had a date with a poor fisherman and his wife, and that encounter would change our lives forever. Bill brought my dad to Christ. Once my dad accepted Christ, he was a radically changed man. He began to study with Bill and later through radio correspondence courses, in order to learn more about the Bible so he could share the good news with other people. With time, he was preaching everywhere on the islands. He went from catching smelly fish to catching messy people. (Sometimes they smelled too…). My father has always been a lover of people and no effort was spared when it came to sharing with the islanders — even paddling his little dug-out canoe multiple hours to get to a site where people had never heard of Jesus. But that’s not the reason I am telling you this story. I told you about a monumental event in my life. That event was my dad’s coming to faith in Christ. That action has had amazing repercussions in my life and that of my extended family to this day. But the most remarkable thing is that when Bill share the good news with my father, the gospel not only saved us, the gospel SAVED us. Every month Bill would come to our little hut on the Amazon and bring two things — a Bible, which he faithfully shared with my dad; and a package that he gave to my mom. What was in the package? Vitamins and parasite medicine. That package saved our lives. Yes, the gospel saved us from eternal doom, but parasite medicine saved us from the doom of the earth. Without Bill’s magic pills, my siblings and I had a good chance of dying before we reached the age of 5. In fact, as I said before, I did have siblings who died before I was born, and my little sister, Marta, died when she was only 2, from chicken pox. Bill, mind you, was not preaching a “social gospel,” he was simply being compassionate toward other people, like the Lord commanded him to be. Billions of dollars have been spent in “world missions” throughout the history of the church, but sometimes all it takes is a few cents to buy the malaria or parasite medicine needed to save lives. I hope you will get up from the couch and find someone to give a package to. Don’t ask me what should be in that package. You go and figure it out. I love this story of your times in the jungle, how God came to preserve your family and have shared it on a number of occasions with other people. What do you tell people when they suggest that you are too passionate about a certain issue? “You are too emotionally attached to this!” “Don’t let your emotions get the best of you!” “You are a single issue person.” I find these comments so condescending. I mean, I don’t go around telling people, “You are as emotional as a corpse!” Sorry, corpse. Some people tell me this kind of stuff when they see my passion for helping the disadvantaged. If they are Christians, it should be a non-issue. The Bible has 2003 references to the poor and most of them are admonitions on how we should treat them. The so-called “quartet of the vulnerable” — the orphans, the widows, the poor and the immigrants, jump at us from multiple pages of Scriptures. As far as I am concerned, as a follower of Jesus Christ, there is no “exception clause” freeing me from serving the “least of these.” It is not an option; it is not a “nice” thing to do. It is part and parcel of what I must naturally do if I indeed want to demonstrate that Jesus is my Master. It should be as natural as walking on two feet is to humans. But the Scriptural argument, often, is not enough to convince even the most devout of Christians. The more conservative they are, tragically, the more inclined they are to say that we should only help the “deserving” poor (whatever that means) or the ones who don’t have a cell phone, a flat screen T.V.’s or, God forbid, mountains of mountain dew piled on their kitchen floor. So I have to appeal to their emotion… I am, after all, an emotional guy, remember? I tell them about walking in the middle of a village of Pygmies in the Central African Republic, where the orange hair, the bloated belly and the sunken eyes of the children told a tale of death and destruction. Then I tell them that I was once one of those children. Now I have them. But this is not just a gimmick. I was, indeed, born into a family of thirteen, in a poor village of fishermen on a tiny island of the Amazon. 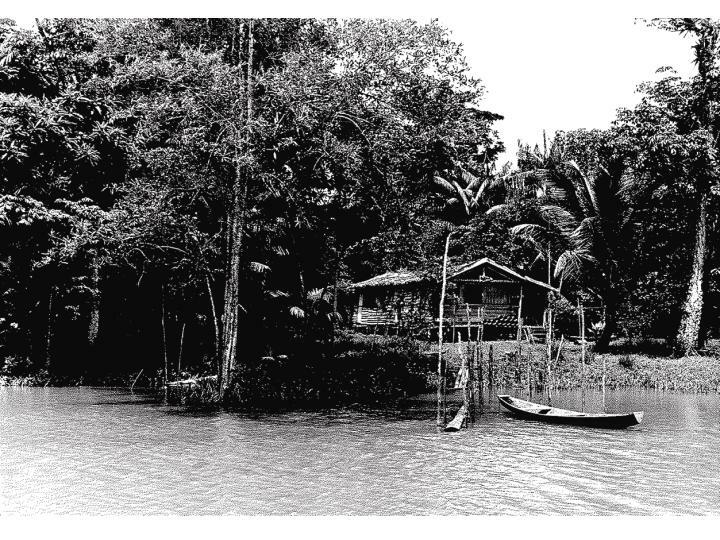 Our hut was built on stilts, thatch roof, a hole for a window, the river for toilet and bathroom, and nothing but seafood and tropical fruits for food. It was hell and paradise all in one place, but we didn’t know it. Since there was food, we weren’t starving, but we were sick. We would go out into the wood to care for our needs and the stuff would run into the same water we used for drinking and bathing. This was, in essence, the same thing that was killing the precious Pygmies of Central Africa, with one big difference — I had food and they didn’t. We had no school, no hospital, and the next city was over two hours away by boat. If you had a serious accident, even if you had the means to get to the city, you would more than likely die on the way. We were forgotten by the world and awaiting a certain death by malaria, small pox, diarrhea or simply by stomach complications caused in by parasites. Actually, three of my siblings did pass away before I was born, and if it had not been for an event that changed the history of my family, I would more than likely not be here telling you this story today. Tomorrow I will tell you what that event was. I just want you to know that I have been reading your blogs…you are an amazing writer! Wow our Savior is awesome! Thanks for your blogs…the one today certainly struck a cord with me but then many of them have….keep it up and I will continue to send people your way to read these blogs.